Years ago when I was growing up in the fifties and sixties just outside of Winston-Salem, NC, we managed to get together with friends and/or relatives on a weekly basis. Often it was under the shade trees at my Aunt Molly’s home in Yadkin County. In the summer there was watermelon and homemade ice cream. It was part of life, it was expected, and everyone enjoyed it. Depending on where we have lived, we have seen varying degrees of this over the years. When we were living on our farm in Tay Creek, New Brunswick, neighbors would drop by regularly. I often wondered if we got visitors because we were the only ones in the settlement with a private phone line which I had fought hard to get. Our experiences with a party line in a much more isolated and not so friendly community in Saint Croix Cove, Nova Scotia were not my idea of fun. It was also a different community. One which was not nearly so open to outsiders. Sometimes scenic beauty comes with a price. While people dropped by then, I am pretty sure it was more of a spying operation then than a friendly visit. As always there were exceptions like Joe, our sheep farming neighbor, whose visit were all part of just being neighborly. When we moved to Halifax, Nova Scotia, we were in a wonderful neighborhood with lots of young children, sidewalks, and an inviting front yard strategically located on a corner. As a result we often saw our neighbors. I can even remember a couple of impromptu dinners where we all migrated to the kitchen and called for a pizza. The neighborhood table ended up in our kitchen. For some strange reason as we moved back to the states, gatherings all took place on the back decks of homes. Even in the short time we lived in Columbia, MD, I can remember some nice crab cracking events. Our house there had come with a board across the deck doors when we bought it. Decks were optional in Columbia, and since for over half our time in Columbia, we were still paying the mortgage on our Halifax home which took a while to sell, we didn’t get a deck in Columbia until the summer before we moved. The home we bought in Roanoke, Virginia is on the side of mountain overlooking the Roanoke Valley and downtown Roanoke. 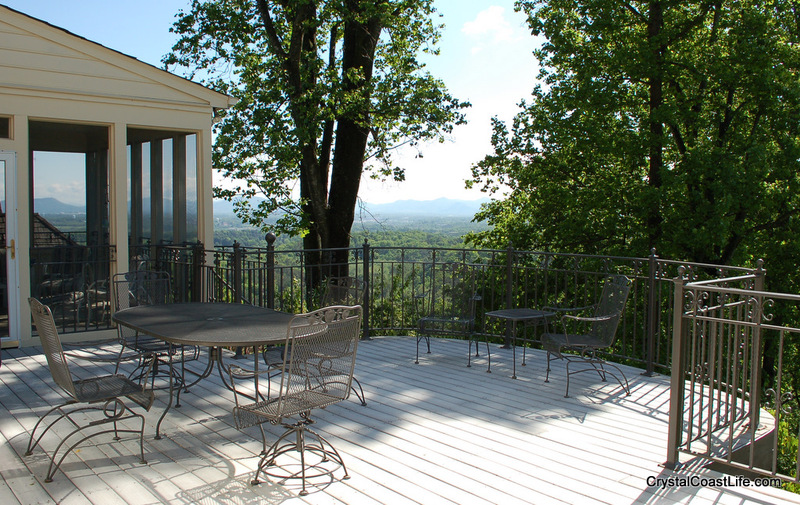 It has a wonderful view and the house came with a huge deck. In 2000, we did some major remodeling and made a our deck which is pictured above, a much more cozy spot. It turned out to be a favorite gathering place for our neighborhood friends. Many evenings were spent discussing our growing children and the issues of importance to the Roanoke Valley. The sense of intimacy and privacy that we got from our deck was wonderful, but as our children have grown and our neighbors have drifted or moved away, it is now a rare occasion when we get together with friends on the deck. Some of that comes from spending most of our own time on the North Carolina coast where I am happy to report that I enjoy perching on the front porch and receiving visitors. I often keep track of old friends through a variety of electronic methods from Facebook to LinkedIn and Twitter. I am old fashioned enough to even use email, the telephone, and even personal visits. I prefer personal visits, but I will use text messages to communicate with our grown children since that seems to be what they respond to best. It occurs to me that often the kind of communication that we have on social networking sites is superficial at best. Some people know how to work it better than others, but usually Facebook is at best a stopgap measure to prevent people you know or might have known from completely disappearing until you really get to visit or talk with them. This year we have had a couple of long neglected friends come visit with us in North Carolina. I guess all my taunts about warm weather finally pulled them down from Canada. It was really nice to renew the true personal connection and see how we have all changed. It had been twenty-three years since we had seen one couple and twenty-six years since we had seen the other. One of the things I like about living in Bluewater Cove near Emerald Isle is that the climate is friendly to people being outside and to having visitors. This year April was a great time to be at the beach. Even the changing patterns of spring weather didn’t stop the fun and warmth on the Crystal Coast after what was a harsh winter. Our subdivision is also a place where people enjoy walking either with a dog, alone, or with a partner. Then there is the clubhouse with the pool where people love to gather in the summertime. Still with a much wider span of ages than in our old neighborhood, pulling together a neighborhood table is a little more challenging. I love to walk over on the Point where the sound, river, and ocean meet, and I do consider the beach part of my neighborhood. Unfortunately most of the people you see there are strangers. And even stranger is that many area residents don’t visit the beach as much as you might expect. I am pretty sure that some residents hardly ever walk the sands over on Emerald Isle. In talking to some older relatives recently, I found that even they have a hard time getting together with extended family much less neighbors. Modern society does a lot to connect us, but at the same time it also isolates us. In our old farming village of Tay Creek, today’s newspaper came in the mail the next day, there were only two channels on the TV, and there was no Internet. People got together to find out what was happening. On our hill in Roanoke, a lot of information was passed about schools and children than never made it to the daily newspaper, and the Internet had yet to become a part of every kitchen. In those days, there were compelling reasons to gather and talk with neighbors. There still are good reasons to keep working towards a neighborhood table where friends see each other eye to eye and pass on information that might not fit very well on Facebook or Twitter. I hope to be part of the conversation instead of part of the problem.